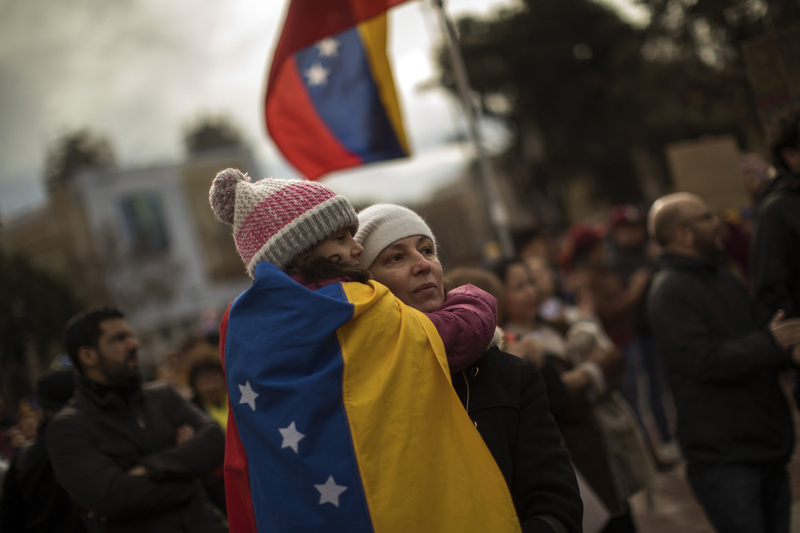 Venezuelans Top Asylum-Seeker List In Spain Spain has recorded more than 255,000 Venezuelans living in the country, with estimates even higher, as families flee the South American country in deep crisis. Venezuelans take part in a rally in Barcelona, Spain, on Feb. 2 to show support for the movement to push Venezuela's President Nicolás Maduro out of office. It's 8 in the morning, and the doors are just opening at the immigrant and refugee services center in Barcelona, Spain. There are about a dozen people from various countries already in line, some of whom showed up as early as 4 a.m. to ensure a good spot. One of those migrants is Javier Quintero, a Venezuelan asylum-seeker who arrived in September. He says back in his hometown of Caracas, there's virtually no medicine or food available. Sometimes there are power outages for days on end. "It's not easy," Quintero says about life in Venezuela. "Even getting to Colombia isn't easy." And making it to Spain is even harder. A plane ticket can cost $1,000, a difficult sum given the South American country's hyperinflation. "Venezuelans don't want to migrate," Quintero says. "We're leaving out of necessity." An estimated 3.4 million citizens have fled Venezuela in recent years amid soaring prices, high crime and shortages of food, medicine and basic goods. Most end up in other Latin American countries. But some of those who can afford the trip fly to Europe, primarily resettling in Spain. The political turmoil they left behind, meanwhile, is deepening. Venezuelan President Nicolás Maduro faces a strong leadership challenge from the head of the National Assembly, Juan Guaidó. The congressional leader has won support from more than 50 countries, including Spain and the United States, that now consider him to be Venezuela's interim president. President Trump has hit Venezuelan government officials and associates with more economic sanctions and says "all options are on the table" for a transition of power. Spain's government has called for a democratic resolution, cautioning against "any foreign military intervention" in Venezuela. As the South American nation's humanitarian crisis continues, it is unclear how many of the fleeing families, workers and students would return, whatever the outcome of the political standoff. From 2015 to 2018, the number of Venezuelans registered in Spain rose 54 percent to more than 255,000, according to Spain's National Statistics Institute. But the total Venezuelan-born population is likely higher if undocumented immigrants are taken into account. Some arrive from Venezuela with Spanish citizenship obtained through grandparents who escaped Spain's civil war in the 1930s. 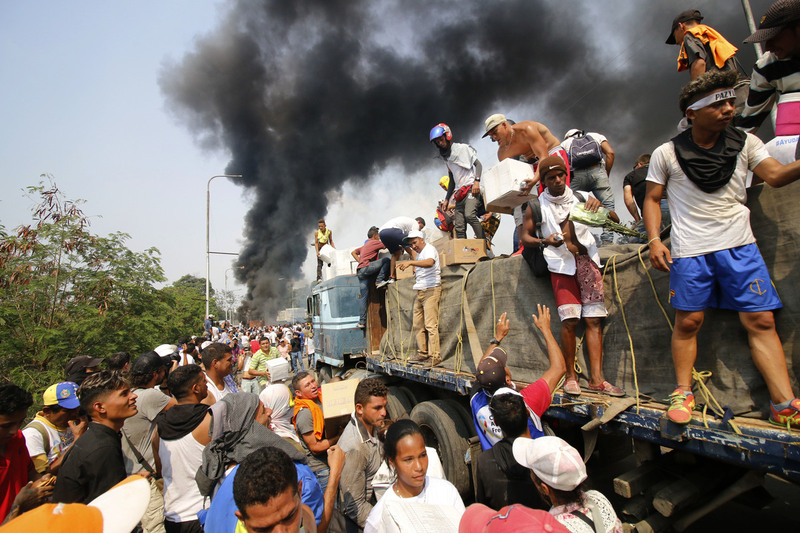 People try to salvage humanitarian aid after the truck carrying it was set ablaze on the Francisco de Paula Santander International Bridge between Colombia and Venezuela on Feb. 23. Others, such as Quintero, come on a three-month tourist visa and apply for asylum. Venezuelans were the largest group of asylum-seekers in Spain last year with 19,000 applications, more than a third of the annual total, according to the nonprofit Spanish Commission for Refugees. "Spain is the European country that most often rejects asylum requests," says Oriol Amorós, secretary of migration for the government of Catalonia. "They're denying around 70 percent of all asylum-seekers. And for Venezuelans, it's almost 100 percent." The commission for refugees said about 24 percent of all claims were accepted in 2018. Many Venezuelans apply for asylum despite knowing this, Amorós says. In Spain, asylum-seekers are granted temporary residency while their papers are being processed. After six months, they can apply for a work permit. Lawyers say the whole asylum application process can take two years. A restaurant named after the traditional Venezuelan dish, Arepas, is run by Venezuelan migrants in downtown Barcelona, Spain. Since 2015, the number of Venezuelans registered as living in Spain has grown from 165,000 to more than 255,000. It's sometimes the easiest way to get papers, says Amorós, "but they're still in a legal limbo, because they don't know if tomorrow they'll get a response. What they do know is that, in most cases, that response is negative." Amorós says many Venezuelan asylum-seekers are high-skilled workers or students. Yet, because of the uncertainty of their situation, they often have to rely on nonprofits or the local government for support. Humberto Mariño, a 38-year-old from Caracas, says that was the case for him. He arrived last April and was joined by his wife and 1-year-old son in November. "When I brought [my wife] here, I thought we'd get help," he says. "But honestly, they didn't help us at all." Mariño says the family had a bad experience with a Red Cross social worker, who took four days to find them an apartment. During those days — which they say were cold and rainy — the three of them had to sleep in the streets. Coromoto Luna, Mariño's wife, says she eventually sold a ring in order to pay for a hostel room. "[The social worker] didn't care about leaving us out in the street," says Luna, 35. The family eventually left the Red Cross program and began to rely on help and support from local activists instead. It was a stark change from their life in Venezuela, where Mariño and Luna were entrepreneurs, traveling often and earning in dollars. But in 2017, the couple say, they were kidnapped and held ransom for $10,000. 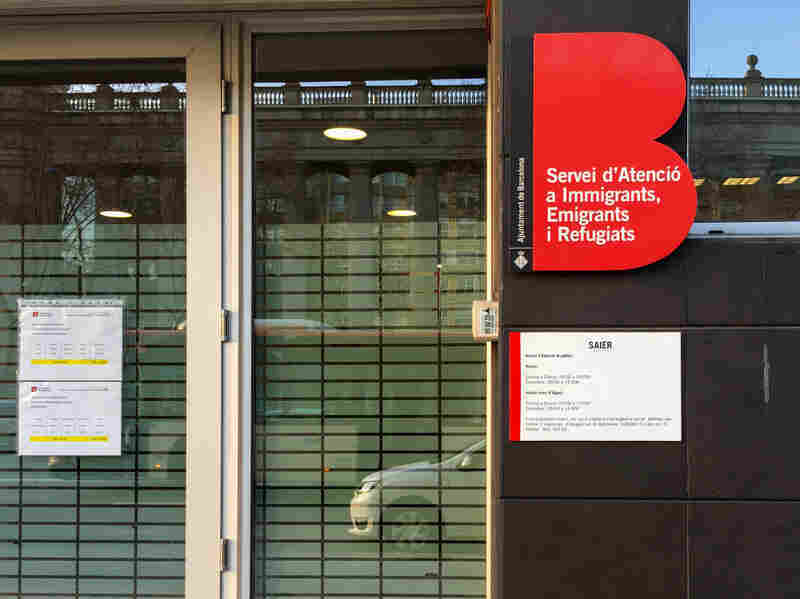 Barcelona's immigrant and refugee services center connects people with social workers and provides them with information to apply for asylum. About 54,000 people applied for asylum in Spain in 2018, with roughly 19,000 of them from Venezuela. "That's when we decided we needed to leave the country," Mariño says. The family's asylum claim is still being processed, but Mariño is hopeful they will be allowed to stay in Spain. He recently obtained a work permit and took jobs at a grocery store and a delivery company — where, he says, "almost all employees are Venezuelan." 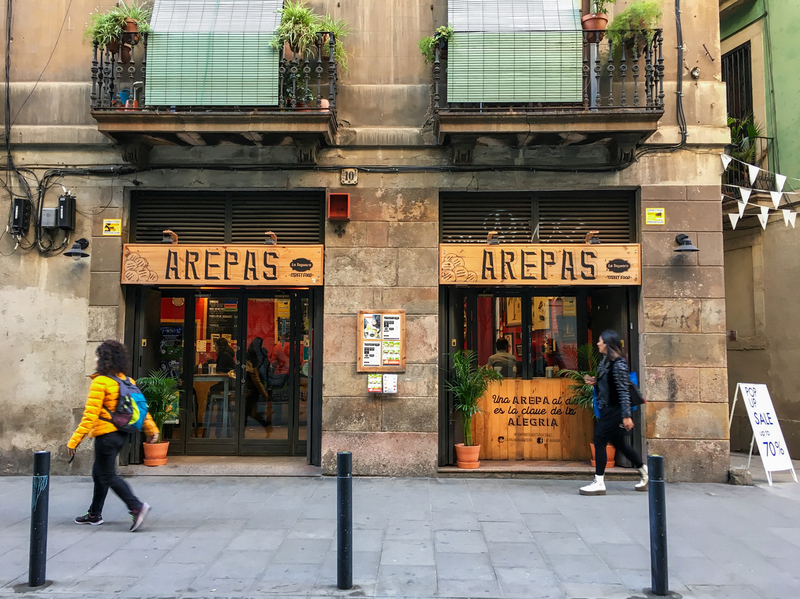 "We didn't even want to come, because we didn't need to, we weren't affected by the crisis," says Mariño, reflecting on their privileged status in a country where it is increasingly hard to put food on the table. But that contributed to their being targeted by thieves and kidnappers. "I know we'll grow like we did in Venezuela," Mariño says. "With time, patience, dedication ... we can do it."